We all do it when we learn a language. I’ve done it, and I’m sure you’ve done it, too. You go through years of speaking English using a particular word, phrase or piece of grammar. Then one day, someone tells you that you’re wrong — what you’ve been using for years is actually not correct. You’ve been speaking “bad” English all this time! Then you want to kill that person! Just joking. You’re probably a lovely person, so you thank them for showing you your mistake and then you don’t make that mistake again. So I’m here to be that guy. You can thank me later! 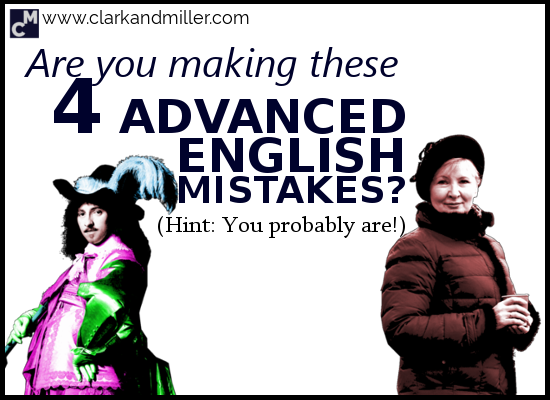 This is part one of a series of common mistakes in English. In this part, we’re going to look at the kinds of mistakes you might be making because you’re using words that you don’t need to. Why are you making this mistake? Descriptive languages usually use a lot of words, while concise languages use fewer words to express the same idea. I’d like to call him Andre. English is a concise language, but a lot of languages around the world are more descriptive. Some examples of descriptive languages are Italian and Russian. So when you’re speaking English, you need to “sound” more like Anita. But if your first language is a descriptive language, your English might well sound like Andre’s. The main trick? Cut out as many words as you can! It’s important to remember that “Andre’s” sentences are still technically correct. They may even be preferable in some particularly formal situations. You’re using two words with the same meaning. You’re using “date,” “location” and “amount” when there’s a more natural solution. You’re using random words that are totally unnecessary. You talk about your university days like a robot. 40 degrees is a temperature, so you don’t need to say “temperature.” Also — that ice cream won’t last long. I still don’t know. + When is the party? = I still don’t know when the party is. Can you tell me? + Where is the camel? = Can you tell me where the camel is? We’ll never know. + How many strawberries did he eat? = We’ll never know how many strawberries he ate. These are called embedded questions and we LOVE using them in English. Why? Well, they just “flow” better, and that’s exactly what Anita likes! This is similar to the first part of this post (about the weather and colours). An accident is a situation — so you only need one of these words. A concert is an event and a project does stuff — we know there are actions. Just cut those words out! The tip: This part of speech is a little tricky to locate, but in the next week, just be aware of how you’re speaking and see if you can “catch” yourself using unnecessary words. When this happens, I’d love to hear about it in the comments! 4. Talk about your university times like a human — not a robot! OK. These are actually all a bit different, but they’re all about university and are examples of sentences I hear all the time. When English learners talk about university, they often sound very, very formal and robotic. I don’t know about you, but my university days were the least formal, not the most formal, days of my life. And this is reflected in how we talk about university. Avoid saying “the University of…” unless it’s a formal situation. Also, you can abbreviate “university” to “uni.” It sounds more friendly! You can say “I studied…” but it’s slightly more natural to say “I did…” It’s more concise, and Anita will like you for it. Were you making any of these mistakes before you read this post? I’d love to hear from you about which mistakes you were making (if any). Also, do you notice other people making the same mistake again and again? Tell me about it — this stuff fascinates me! So be awesome, join in the discussion and leave your comments below! Yes, I’ve been making this mistakes specially adding more words giving out the same meaning. Thanks for commenting. Yes — sometimes grammar and vocab aren’t enough to fix our mistakes. It’s good to know that you now know what to do! Actually, I have been speaking English (language) for 11 years; I still make these (mentioned) mistakes. I think I didn’t pay attention,but now I will (pay attention). The brackets are to let you know if I truely learnt. That’s fantastic news. Your comment shows that you definitely understood well! Uni? Hmm, I feel it’s a bit too informal for me. I feel if it’s as if I called you Gabby. Mind you, it could depend on where you live. There are sometimes cultural differences depending on the country. It’s more or less impossible to say “which English is right.” But it’s good to be aware of the flexibility of the language. But it really does depend on so many factors, your immediate situation and where you are in the world (or the country) for example. Yeah! There are some things that mere grammar and vocabulary don’t address. Then why do all elementary level study books have sentences like “The weather is sunny and warm” (the reference to No. 1)? They have been written by native speakers. Have we been teaching it wrong? Hmmmm…. I’ve found that a lot of the coursebooks have very, very unnatural English in them. This is a very common complaint about them in fact. If you find the time, check out Scott Thornbury’s articles on this topic. Dear Gabriel! You are a great teacher. The problem is that I am a cursed Italian talkative who has decided to learn English at the age of 80. What do you think? Am I crazy or not? HELLO! You’re never too old to start learning! Also, the “mistakes” in this post are only mistakes if you want to speak more like a Brit or an American. As long as you’re understood, you should be happy to express yourself like an Italian! When I saw the sentence “We’ll never know the amount of carrots he ate” in your picture, I thought the mistake was going to be that we don’t use “amount” with countable nouns. It should be “number,” shouldn’t it? We’ll never know the number of carrots he ate. Or we’ll never know the amount of milk he drank. I am not positive of the rule, but that seems right to me. However I’m an American so maybe American English is different…? That’s a really good point, and yep — it’s the same in the UK and Aus. I actually included that extra “mistake” because it’s usually in that form (regardless of countable or uncountable nouns used) that I’ve heard this particular mistake. So I figured that those who do make this mistake would recognise it as their error. If it is possible to make your language even more concise, do it. Meanwhile, in North American English, being vague is viewed as a character weakness. So “I still don’t know when the party is,” is viewed as ineffectual whining undeserving of a response, whereas “When is the party?” is more likely to receive a positive (and informative) response. I like the advice. One step further! The way you put it sounds more narural , I like it. I’ve been doing the same mistakes. Thank you. Great! I’m so glad to help! The way you put it sounds more natural and good. I liked it. I’ve been doing the same mistakes for years, thanks for the explanation. I’m really happy that this helped. Sometimes sounding natural is about more than just grammar and vocabulary, right? Fun article, and I love the way you respond to comments. As I teacher, I find this stuff useful and intriguing too. I think students veer towards the formal because they so often need English for a job interview, but sounding human really is everything! Andre must be stopped! Yes, most learners have a very formal English education. I think this really gets in the way of learning the language as a whole. It gives learners “bad instinct” for English because informal language is the most natural form of the language. It came before formal language, which was built on top of it. What’s more, most job interviews and business environments today are becoming less and less formal. They would hire Anita over Andre. Let’s stop Andre, put him in a cupboard and only bring him out for those super-formal situations that happen once in a while. I agree with most of your points, I can’t even count how many times I’ve corrected sentences like “The weather is sunny.” I don’t know where the students get it, I’ve always taught “it’s sunny” and that’s also how the books I’ve used teach it. But I’d say that the two sentences in your last point about the Camel Studies have two different meanings – studying in the Department of Camel Studies doesn’t necessarily mean doing Camel Studies. E. g. if I say: “I studied in the Department of English and American Studies” that doesn’t mean I did English and American studies. Some people do English Studies, some do American Studies, others do Literature, Translation, etc. but it’s still in the same department. So, “I studied in the Dept. of E. and Am. Studies” isn’t the same as “I did E. and Am. studies”. Such a good point. And one I hadn’t totally considered. It kind of makes the whole issue of “overladen” sentences more important to point out to our students I guess. When I hear students talk about studying in the department of camel studies, what they’re trying to say is that they studied Camel Studies. So their over-explicitness is actually making them less accurate. Great post! It helped me a lot. Thanks to Anita and thank you! Thanks for the thanks and I’m glad you found it useful.